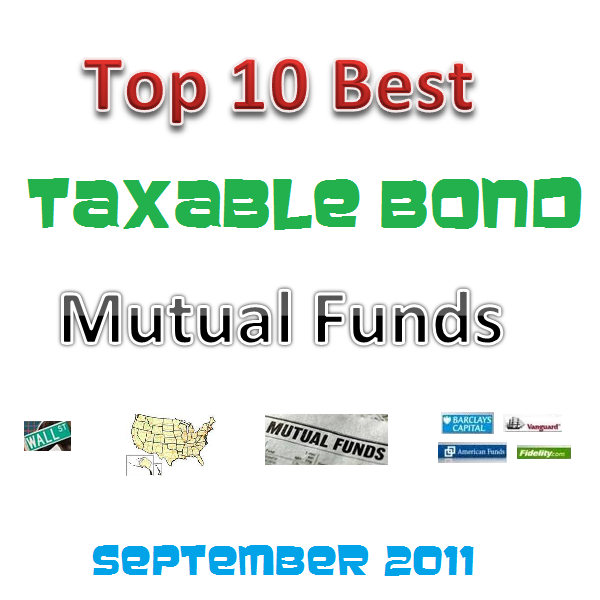 The following article is about Top 10 best taxable bond mutual funds 2011 for the past 3 years. The top funds include Old Mutual Dwight High Yield, Delaware Extended Duration Bond A, TCW Emerging Markets Income, Direxion Monthly 10 year Note Bull 2x, PIMCO Long Duration Total Return I, etc. The list is recently updated on MEPB Financial. There are two types of bond mutual funds: taxable bond funds and non taxable bond funds. The taxable bond funds provide regular income to investor which is taxable under federal tax rates and state tax rates. Some states may not tax this type of bonds. 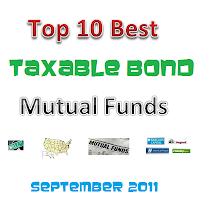 The non-taxable bond funds are also known as Municipal bond mutual funds or muni bond funds. These muni bond funds provide an income which is exempt from federal tax. There are variety of taxable bond funds include mortgage backed bond funds, hybrid bond funds, multi sector bond funds, asset backed bond funds, bank loan bond funds, corporate bond funds, government bond funds or treasury bond funds, high yield bond funds or non-investment grade bond funds, foreign bond funds, emerging markets bond funds, and many more. These funds don’t correlate closely to stock markets. Bonds may outperform stocks. Bond funds can be used to weather volatile market environment especially during economic crisis, depression era, recession environment, etc. 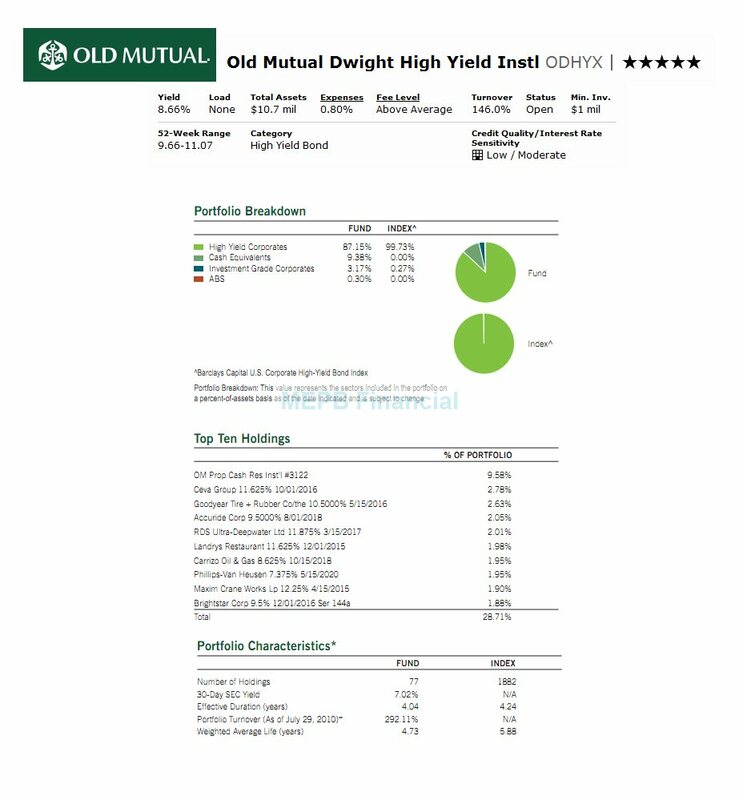 The Old Mutual Dwight High Yield Instl fund’s objective is to seek a high level of current income. The fund typically invests >80% of net assets (plus any borrowings for investment purposes) in high-yield, below investment-grade securities including high-yield corporate bonds and loans, municipal bonds, mortgage-backed and asset backed securities, income-producing convertible securities and preferred stocks. It may invest up to 30% of assets in U.S. dollar denominated foreign debt obligations. The fund may also invest in derivative instruments. Edward B. Meigs has managed this fund since its inception in November 2007. This fund shares 7.70% dividend yield that is distributed monthly. The last dividend was paid in July 2011 ($0.07). It has 0.80% annual expense ratio. This fee is lower than the average annual expense ratio in the High Yield Bond category (1.16%). This best bond fund has total net assets of $11.52 million. This is a no-load fund. This ODHYX fund has 2.35% YTD return. This fund is on the 5th YTD rank in the category. 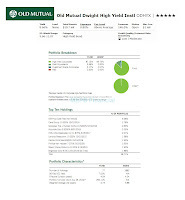 This Old Mutual Dwight High Yield Fund uses Barclays Capital U. S. Corporate High-Yield Bond Index as the benchmark. The CUSIP of this fund is 68002Q214. The portfolio breakdown as of March 2011 is 87.15% in High Yield Corporates, 9.38% in Cash Equivalents, 3.17% in Investment Grade Corporates and 0.30% in ABS. There are several investment risks in this fund like credit risk, counterparty risk, high yield risk, liquidity risk, interest rate risk, prepayment risk, changes in debt rating and foreign securities. 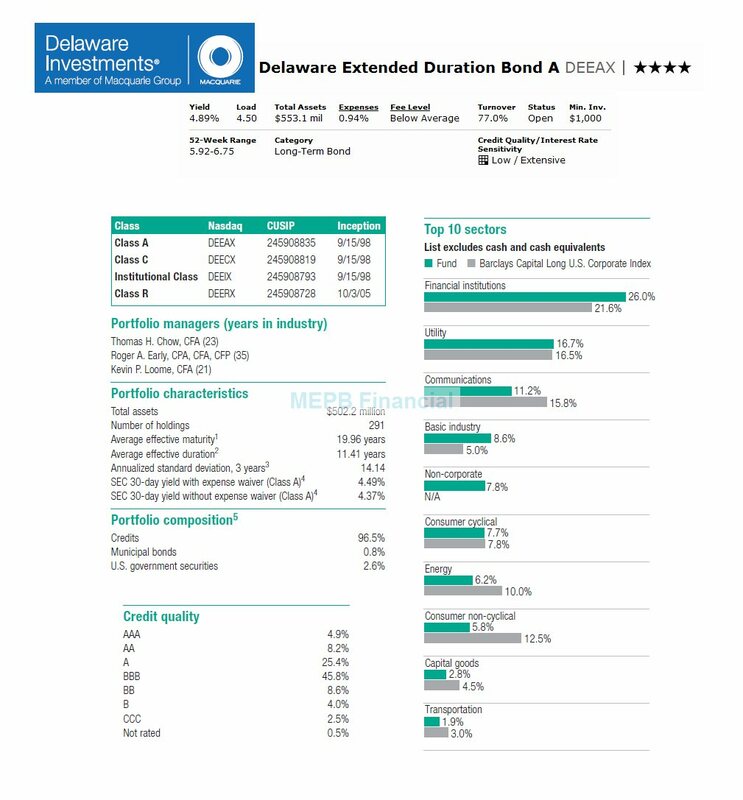 The Delaware Extended Duration Bond fund objective is to provide total return. The fund typically invests most of assets (>80%) in corporate bonds rated BBB or better. It may invest <20% of assets in high-yield corporate bonds and may invest <35% of total assets in foreign securities. The average portfolio duration of the fund will generally vary within 2 years (plus or minus) of the current average duration of the Barclays Capital U.S. Corporate Investment Grade Index, which as of October 31, 2010, was 6.65 years. This Delaware fund was introduced to public in September 1998. The lead manager of this bond fund is Thomas H. Chow (since May 2007). This fund shares 4.92% dividend yield. It charges 0.94% yearly annual expense ratio. The average annual expense ratio in the Long-Term Bond is 0.89%. This DEEAX fund has 149% of annual holdings turnover as of August 2011. To start investing this fund, investor will need a minimum of $1,000 for brokerage account and $250 for IRA account. This fund charges 0.30% management fee and 4.50% front-end sales load fee. Since its inception in 1998, this fund has recorded 10 years of positive return and 2 years of negative return. The 2 negative years was in 1999 (-5.74%) and 2008 (-2.84%). The best 1-year total return was in 2009 with 25.00%. Based on the load adjusted return, this fund has returned 8.92% over the past ten years and 4.78% over the past year. The other classes of this fund are Class C (DEECX), Institutional Class (DEEIX) and Class R (DEERX). The expense ratio of DEECX is 1.70%, DEEIX is 0.70% and DEERX is 1.20%. Barclays Capital Long U.S. Corporate Index is the fund’s benchmark. As of June 2011, the top sector breakdown of this Delaware fund is Financial Institutions (26.0%), Utility (16.7%), Communications (11.2%), Basic Industry (8.6%), Non-Corporate (7.8%), Consumer Cyclical (7.7%), Energy (6.2%), Consumer non-cyclical (5.8%), Capital Goods (2.8%) and Transportation (1.9%). The TCW Emerging Markets Income investment seeks high total return from current income and capital appreciation. The fund invests at least 80% of assets in debt securities issued or guaranteed by companies, financial institutions and government entities in emerging market countries. The debt securities in which the fund invests may consist of securities that are unrated or junk bonds (rated BB / Ba or lower). This TCW fund generally invests in >4 emerging market countries. The fund is non-diversified. The portfolio managers of this emerging markets bond fund are Penelope D. Foley (since 1990), David Robbins (since 2000) and Javier Segovia (since 1995). This best rated fund was introduced to public in June 1998. This TCW fund shares 6.66% dividend yield and it is distributed monthly. The recent dividend distribution was in July 2011 ($0.05). The fund charges 0.92% annual expense ratio, bit higher than the average in the Emerging Markets Bond category (1.30%). The annual holdings turnover as of August 2011 is 172.75%. The minimum initial investment for brokerage account in this TCW Emerging Markets Income fund is $2,000 (for either Class I or Class N). For the IRA account, the initial investment is $500. This is a no-load fund. This fund can be purchased from 65 brokerages. Morningstar gave this fund 5-star rating because since its inception this fund has only 1 year negative return in his 12 years performance. The best 1-year total return was in 2009 with 44.78%. Based on the load adjusted return, this fund has returned 15.86% over the past year and 12.82% over the past five years. The portfolio sector distribution as of June 2011 is 62.41% in Corporates, 27.07% in Sovereigns and 7.69% in Quasi-Sovereigns. The top country breakdown is Brazil (13.57%), China (9.75%), Russia (9.07%), Argentina (8.51%) and Mexico (7.89%). The Direxion Monthly 10 Year Note Bull 2X fund is seeking monthly investment results, before fees and expenses, of 200% of the performance of the NYSE Current 10-Year U.S. Treasury Index. This leveraged bond fund invests >80% of net assets in securities that comprise the index and/or financial instruments that, in combination, provide leveraged and unleveraged exposure to the index with the fund creating long positions. It is non-diversified. Paul Brigandi is the fund’s manager since April 2005. The fund was incepted on March 2005. The annual expense ratio is 1.90%. This fund is in the category of Long Government. This fund has 0.25% 12b1 fee and no sales load fee. 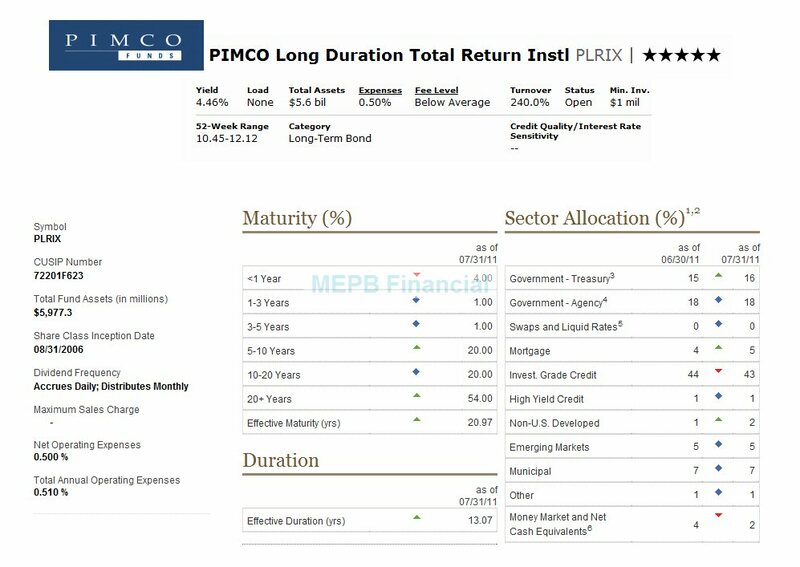 The PIMCO Long Duration Total Return fund objective is to provide maximum total return, consistent with prudent investment management. This PIMCO bond fund invests >65% of total assets in a diversified portfolio of Fixed-Income Instruments of varying maturities, which may be represented by forwards or derivatives such as options, futures contracts or swap agreements. It invests primarily in investment-grade debt securities, but may invest <10% of total assets in high-yield securities or non-investment grade bonds. 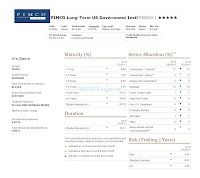 This PIMCO fund was introduced to public in August 2006. The fund is currently managed by Stephen Rodosky. He has been with the fund since July 2007. This PLRIX fund shares 4.62% dividend yield and is paid monthly. The last dividend distributed in July 2011 is $0.04. The annual holdings turnover is 240.0%. The fund has total net assets of $5.67 billion. It also has an annual expense ratio of 0.50% and the expense fee average in the Long-Term Bond category is 0.89%. The other class of this fund is Class P (PLRPX). The performance of this fund since its inception is always in positive return. The best was in year 2008 with 12.38%. 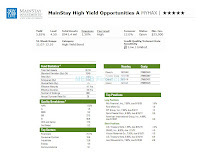 Morningstar gave this fund 4-star rating. Based on the load adjusted return, this fund has returned 7.36% over the past year and 12.44% over the past three years. The YTD return is 14.74%. This fund has 12.51 years effective duration and 20.46 years of effective maturity. The top sector diversification of this fund as of June 2011 is Investment Grade Credit (44%) and Government Related (33%). The benchmark of this fund is Barclays Capital Long-Term Government/ Credit Index. 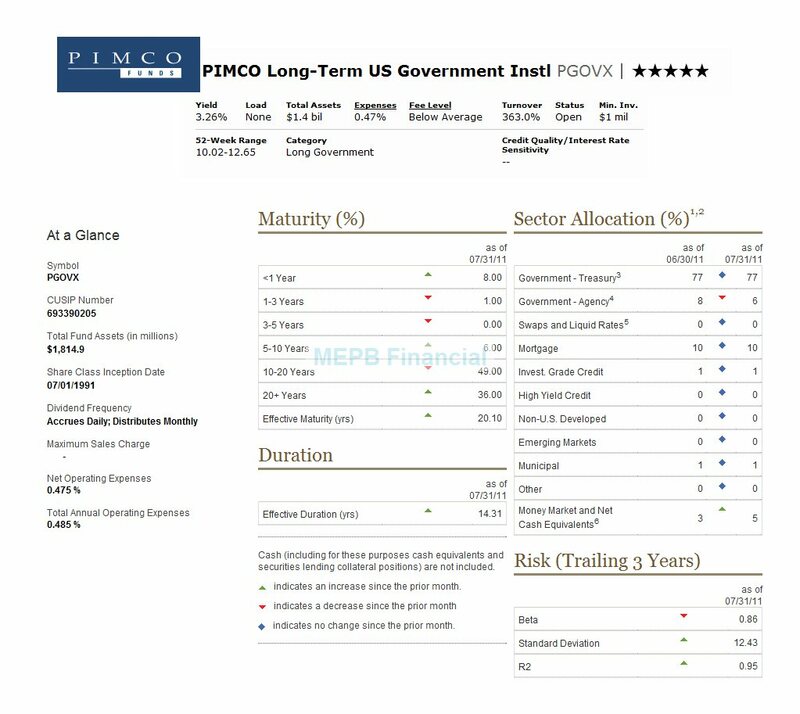 The PIMCO Long-Term US Government investment seeks maximum total return consistent with preservation of capital and prudent investment management. The fund normally invests >80% of assets in a diversified portfolio of fixed-income securities that are issued or guaranteed by the U.S. government, its agencies or government-sponsored enterprises (U.S. government Securities). It may invest in derivative instruments, such as options, futures contracts or swap agreements, or in mortgage-backed securities. Stephen Rodosky is the current lead fund’s manager of this PGOVX fund. The fund was in the market since July 1991. The fund shares 3.55% dividend yield. Investor in this fund had just received their $0.03 dividend paid in July 2011. The annual expense ratio is 0.47% while the average in the Long Government category is 0.84%. This is a no-load fund. The total net assets of this fund are $1.60 billion. This fund is available in many other classes, such as Class A (PFGAX), Admin Class (PLGBX), Class B (PFGBX), Class C (PFGCX) and Class P (PLTPX). The annual expense ratio of PFGAX is 0.835%. The effective duration of PGOVX fund is 13.83 years and the effective maturity is 19.97 years. As of June 2011, the sector diversification of this fund is 85% in Government related, 10% in Mortgage, 3% in Net Cash Equivalents, 1% in Investment Grade Credit and 1% in Municipal. 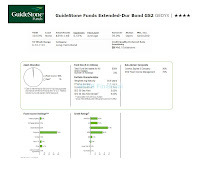 The GuideStone Funds Extended-Duration Bond GS2 fund’s objective is to achieve maximum total return consistent with the preservation of capital. The fund usually invests majority of net assets (>80%) in fixed income securities. It may hold <30% of assets in obligations denominated in non U.S. dollar currencies, and may invest beyond this limit when considering U.S.-dollar-denominated securities of foreign issuers. The fund may invest and reinvest in long or short derivative instruments such as futures contracts, options, and swap agreements. 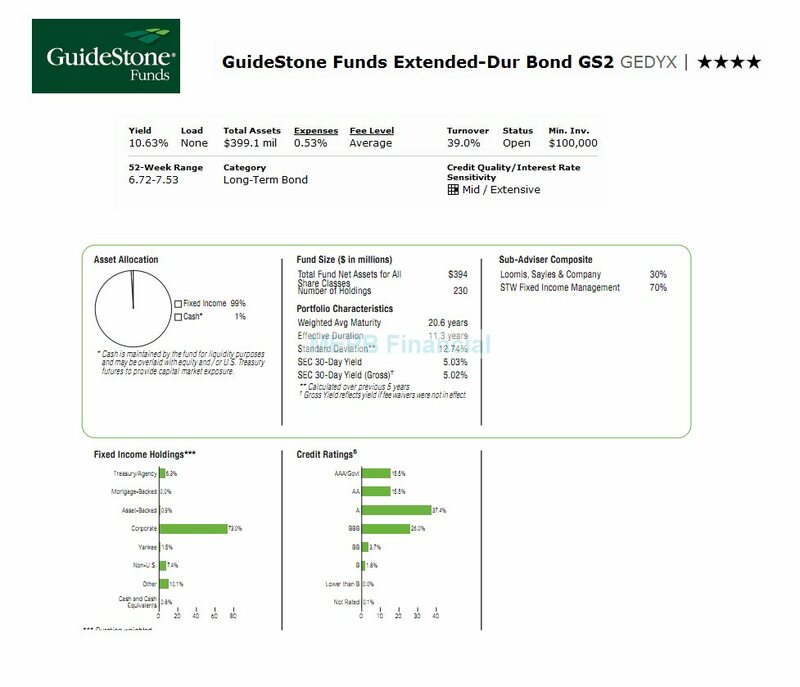 This GEDYX fund has 4-star rating from Morningstar. It shares 10.66% dividend yield. Neil G. Sutherland has managed this fund since November 2008 while this fund was introduced to public in August 2001. The fund charges 0.53% annual expense ratio. The fee is lower compared to the average in Long-Term Bond category (0.89%). The fund has total net assets of $ 409.71 million. It is a no-load fund. The other share of this fund beside the GS2 is GS4 Shares. This fund can be purchased from a limited of 4 brokerages. They are CommonWealth PPS, Fidelity Institutional FundsNetwork, CommonWealth Universe and DailyAccess Corporation FRIAG. The performance of this fund within its 9 years in the market is 8 years of positive return and 1 year of negative return. The worst achievement so far was in 2008 with -8.12%. The performance of this fund based on the load adjusted return is 8.89% over the past year, 12.92% over the past three years and 9.90% over the past five years. The asset allocation of this fund as of July 2011 is 99% in fixed income and 1% in cash and cash equivalents. The fund uses Barclays Capital Long-Term Government Index and Barclays Capital Long-Term Credit Index as its benchmark. 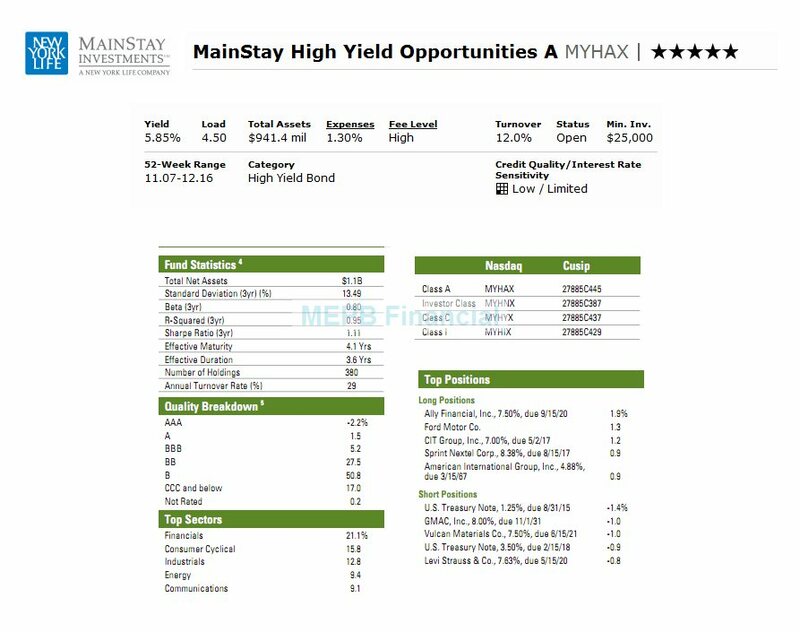 The MainStay High Yield Opportunities fund is seeking to provide current income with capital appreciation as its secondary consideration. This MainStay bond fund invests >80% of assets in high-yield corporate debt securities, including all types of high-yield domestic and foreign corporate debt securities that are rated below investment-grade. It generally holds long positions, equal to approximately 140% of net assets and short positions, equal to approximately 40% of net assets. This top taxable bond fund’s manager is Dan Roberts since its inception in December 2007. The fund has $1.12 billion total net assets. As one of the High Yield Bond, this fund shares 5.48% dividend yield. The last dividend was distributed in July 2011 ($0.06). The fund charges 1.30% annual expense ratio. The annual holdings turnover is 29.0% as per August 2011. The fund has 0.25% 12b1 fee and 4.50% front-end sales load fee. The fund currently has -2.08% YTD return. Based on the load adjusted return, this fund has returned 4.89% over the past year and 13.93% over the past three years. Investor can choose from any other classes of this fund, such as Investor Class (MYHNX), Class C (MYHYX) and Class I (MYHIX). The effective maturity of this fund is 4.1 years and the effective duration is 3.6 years. As of June 2011, this fund has 380 total holdings. The top sectors of this fund as of June 2011 are Financials (21.1%), Consumer Cyclical (15.8%), Industrials (12.8%), Energy (9.4%) and Communications (9.1%). The Dreyfus International Bond investment seeks to maximize total return through capital appreciation and income. The fund typically invests most of net assets (>65%) in non-U.S. dollar denominated fixed-income securities of foreign governments and companies located in various countries, including emerging markets. The fund may invest <25% of assets in emerging markets generally and <5% of assets in any single emerging market country. It is non-diversified. 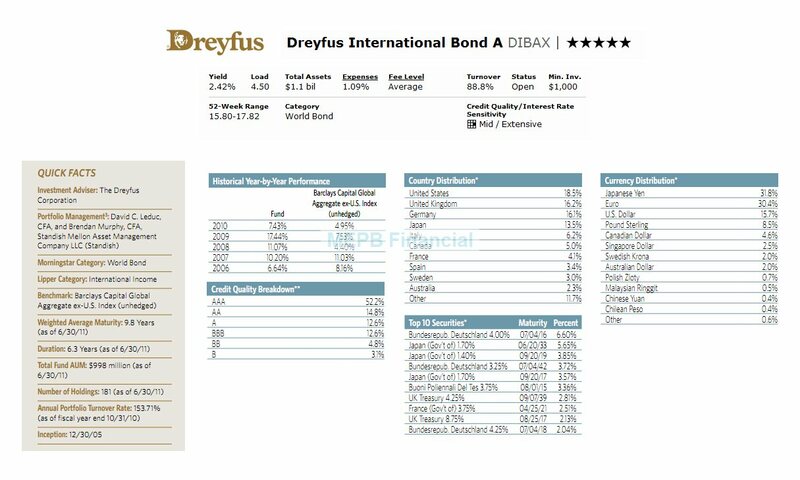 This Dreyfus International Bond was introduced to public in December 2005. The lead manager of this fund is Brendan C. Murphy. She has managed this fund since May 2011. The fund has a dividend yield of 1.87%. This yield is distributed monthly. The last distribution was in August 1, 2011 ($0.10). The total net assets of this fund are $ 1.03 billion. The fund’s annual expense ratio is 1.09%. The fund is classified as the World Bond fund. The minimum initial investment of this DIBAX fund is $1,000 for brokerage account and $750 for IRA account. There is no management fee. The front-end sales load is 4.50%. The fund is available for purchase from 78 brokerages. The other classes of this fund are Class C (DIBCX) and Class I (DIBRX). The fund uses Barclays Capital Global Aggregate ex-U.S. Index (unhedged) as its benchmark. As of the second quarter of 2011, the top country distribution is United States (18.5%), United Kingdom (16.2%), Germany (16.1%) and Japan (13.5%). 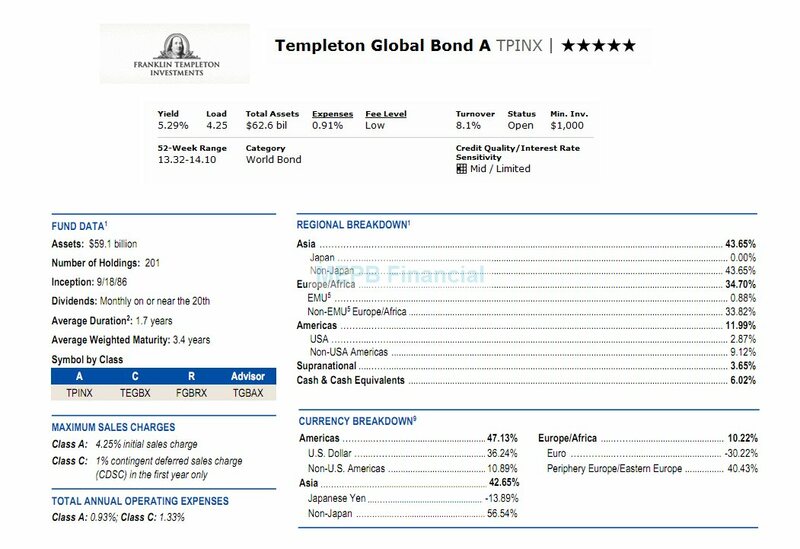 The Templeton Global Bond fund’s objective is to provide current income with capital appreciation and growth of income. The fund invests majority of net assets (>80%) in bonds including debt securities of any maturity, such as bonds, notes, bills and debentures. It may invest <25% of total assets in bonds that are issues rated in the top of four rating categories by independent rating agencies such as S&P or Moody’s Investors Service or, if unrated, determined by the fund’s investment manager to be comparable. The fund is non-diversified bond fund. As part of Franklin Templeton funds, this TPINX fund has total net assets of $61.51 billion. The fund is managed by Michael Hasenstab since January 2001. This fund was introduced to public in September 18, 1986. The fund has a dividend yield of 5.71% and this fund just distributed $0.05 dividend in August 15, 2011. It has an annual expense ratio of 0.91%. This fee is lower than the average in the World Bond category (1.13%). To start investing in this fund, investor will need $1,000 for brokerage account. The 12b1 fee is 0.25% and 4.25% front-end sales load. Since its inception, this fund has recorded in 21 years of positive return and 3 years of negative return. The YTD return is 4.62%. Investor may choose the other classes of this fund such as Class C (TEGBX), Class R (FGBRX) and Advisor Class (TGBAX). The annual expense ratio of TEGBX is 1.33%. 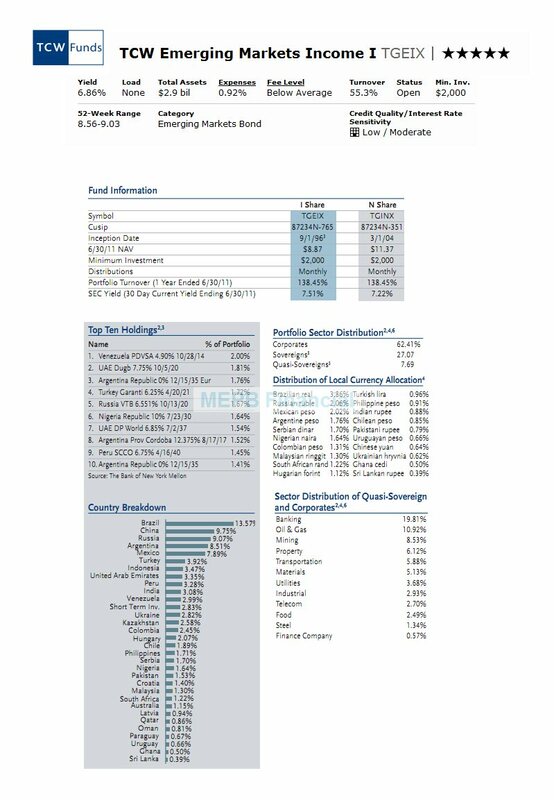 As of June 2011, the top regional breakdown of this fund is Asia (43.65%), Europe/ Africa (34.70%), Americas (11.99%), Cash & Cash Equivalents (6.02%) and Supranational (3.65%).